THINK CAMPING IS ONLY FOR THE WARM MONTHS? THINK AGAIN! 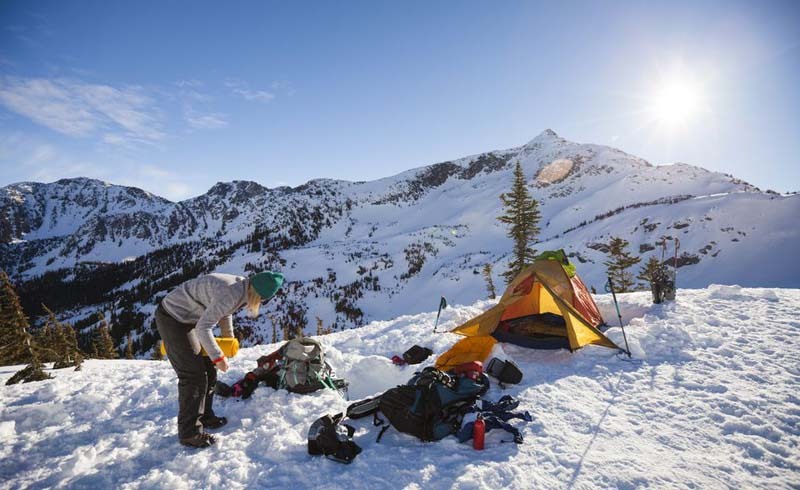 WITH PROPER PLANNING AND THE RIGHT GEAR, YOU CAN ENJOY YOUR FIRST WINTER CAMPING ADVENTURE. There isn’t much better than a weekend out in the woods camping, with the smell of campfire, the familiar sounds of the forest, and the comfort of friends close by. But when summer ends, so does the adventure of camping, right? Wrong! For those who dare brave the cold and snow, camping season never truly ends. Do you have what it takes to be a winter camper? I’m certain that with these tips you will be happy in your tent in the middle of winter this year. When there is snow everywhere, it doesn’t take long before your belongings get wet. For that reason, you need to take precautions to make sure everything that needs to stay dry, does. If you are car camping, this can be as easy as storing everything in plastic totes to keep the moisture away. If you are backpacking, garbage bags can be your friend. I like to put a large garbage bag into my backpack as a sort of liner, and pack everything inside the bag; this way, if I throw my bag down into the snow, there is a barrier between the snow and my important things, like my clothes and sleeping bag. While winter camping, I always use two sleeping pads. One closed cell foam pad, then an air mattress on top of that. With this setup, the closed cell pad will do most of the heavy lifting with regards to insulation, and the air mattress will provide you the necessary comfort. Plus, if the air mattress deflates mid sleep, you’ll still have a padded barrier between yourself and the cold ground. That said, if you can only take one sleeping pad with you in the winter, make sure it’s closed cell foam. Embrace the Water Bottle Heater. Most new winter campers have a hard time getting used to sleeping in the frigid temperatures. To be honest, I don’t think anyone ever fully gets used to it, but there are some options to help you get a good night’s sleep: All you need is an extra wool sock and a hard wall water bottle. Before bed, boil a pot of water then let it cool for a few minutes. Pour the hot water into your water bottle, seal it up tight, then slide it into a wool sock to insulate it. Voila! You now have an external heat source that typically lasts a few hours. I usually keep mine at the bottom of my sleeping bag to keep my feet toasty, but take care not to burn yourself when doing so that. Let the water cool enough to be safe yet still hot. If you are fortunate enough to be camping on lots of snow, you have the option of digging a foot well in the vestibules of your tent. This will allow you to sit in the doorway of your tent as you put your boots on. If you don’t have a shovel with you, and you happen to be snowshoeing, one of your snowshoes will make a great shovel to dig out your foot well. Pack a Warm Sleeping Bag. Nothing is worse than shivering through the night, so be sure to pack a sleeping bag that is plenty warm enough for the temperature. I like to bring a sleeping bag that’s rated for temperatures at least 10 to 15 degrees colder than the expected low. That way you have a comfort buffer, because anyone who has camped in the cold before knows that, just because the bag is rated for 20 degrees, you won’t necessarily be comfortable in it at 20 degrees. I admittedly don’t always follow this piece of advice, and often camp in a season tent. 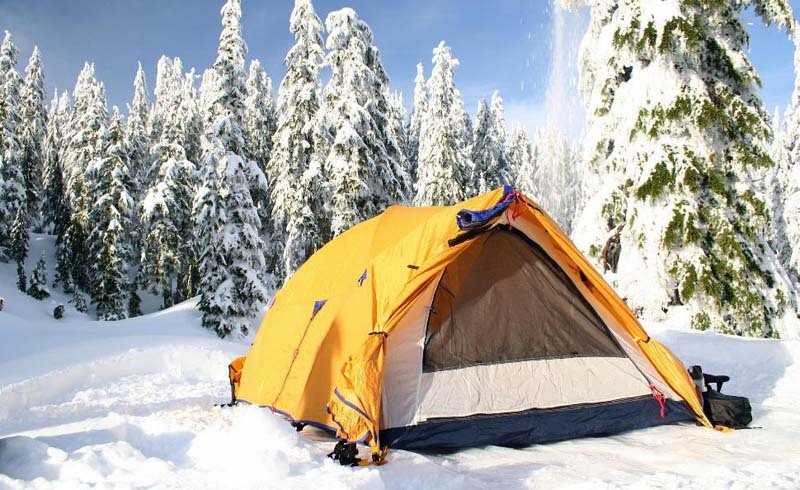 That said, a 4-season tent is the ideal way to camp during the winter, because 4-season tents have far less mesh paneling than their 3-season counterparts. They also typically have more guy line points to secure the fly during inclement weather. Above all, remember to stay safe and warm out there. Winter camping can be a blast, but if you aren’t careful, it can also be dangerous — preparation is key. Do you have any tips for camping in cold weather? Let us know in the comments.